Have you installed pet screen? Like many homeowners there is a high likelihood that you haven’t. Probably because you didn’t know pet screen was available. Installing our durable pet screen is a great way to upgrade your screen doors, sliding screen doors, porch screens and window screens. It is made from a heavy duty high grade scratch resistant fiberglass composite. It is specifically designed with greater strength than traditional screens. It will hold up against the abuse caused by dogs that jump onto screens and cats that love to climb them. It is the perfect choice for high traffic areas like sliding patio screen doors, porches, decks, and gazebos. Their added strength and resistance to damage will give you long lasting screening that also helps keep unwanted bugs from getting inside your home. 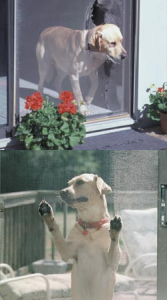 Our custom pet screens are made to fit any window, door, or porch size. We highly recommend getting your pet screen installed so you never have to deal with damaged screens again! We can install a pet screen on any sized window, doors, screened in patio or porch. Please contact us today and inquire about our pet screen services in Staten Island!